Season’s greetings! I am delighted to report that our journal—Manufacturing & Service Operations Management (M&SOM)—reaches new heights in 2018. 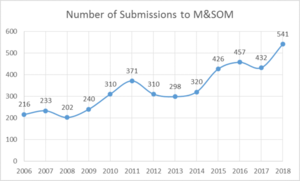 A new record: M&SOM received over 500 submissions in 2018! Stable cycle time: average cycle time = 64 days (similar to previous years). Special Issue on Sharing Economy and Innovative Marketplaces: Co-edited by Saif Benjaafar (University of Minnesota) and Ming Hu (University of Toronto). Special Issue on People-centric Operations: Co-edited by Guillaume Roels (INSEAD) and Brad Staats (UNC). Data Research Challenge: Co-hosted with Cainiao (the logistics arm of Alibaba). These exciting developments would not be possible without the support of our community! I am grateful to all of you for your continued support of M&SOM so that we can make the journal and our community bigger and stronger! In the Manufacturing & Service Operations Management (M&SOM) editor’s column, “Renewing my Commitment to the OM Research Community,” Chris Tang highlighted that M&SOM embraces innovative and relevant operations management (OM) research topics and different research methods (analytical, empirical, behavioral, experimental, field-based, etc.). Although some methods have frequently graced the pages of the journal, others, such as field experiments, are less common. In an effort to support the mission of the journal and facilitate future research, we are working on an article on field experiments in operations management. The goal of the article is to provide an overview of the mechanics of running field experiments, to identify challenges that may arise, and to offer thoughts on areas in need of exploration. Through this post, we would like to request your feedback from your own attempts to conduct field experiments. As Manufacturing & Service Operations Management (M&SOM) nears 20 years of publication history, it is an appropriate time to reflect upon its achievements. This paper is a retrospective look at nearly 20 years of publication output of M&SOM using citation analysis. A search in Scopus was made in September 2017 to extract all published materials from Manufacturing & Service Operations Management journal for ‘all years’. This resulted in the collection of 623 documents, of which 560 were journal articles - the data for this study. The rest of the documents (e.g. book reviews) were discarded. We collected all the metadata that were available in Scopus for download which included all bibliometric data, such as authors, publication year, title, abstract, cited references, and so on. In this blog, we will mainly focus on the 2,564 author keywords and 6,599 index keywords in order to disclose the trends. Based on the observation, we will then provide some implications for M&SOM and its readership and for the general manufacturing and service operations management literature. I am honored and privileged to serve M&SOM for the second term (2018-2020). To renew my commitment to the OM research community, I write to share my plan for the next 3 years. Happy New Year! Thank you for your continued support of Manufacturing & Service Operations Management (i.e., the M&SOM journal). I wish to report some of the highlights for the year of 2017. Management research journal editors, practitioners, and even researchers lamented that most management articles are filled with rigorous analysis but they lack innovative ideas that can challenge the way researchers think and/or change the way practitioners act. Without innovative research ideas to spark the interest of researchers and practitioners, our research community cannot grow and the impact of our research will be limited. Many organizations (police departments, non-profit healthcare organizations, etc.) and corporations (airlines, banks, hotels, manufacturers, etc.) embrace Business analytics (BA) to conduct exploratory, descriptive, predictive, and prescriptive analysis. At the same time, universities developed BA degree programs, INFORMS developed BA certification programs, and researchers developed new techniques (machine learning, deep learning, etc.) to gain insight and drive business planning. Happy New Year! Starting January 1, 2017, the M&SOM journal is on the Financial Times Top 50 journal list. M&SOM achieved new heights in 2016. First, the number of original submissions hit a new record. We received 460 original submissions as of December 10, 2016. In addition to United States and Canada, we have received more submissions from Asia and Europe. Also, we have received more submissions in the area of healthcare operations, empirical OM, and innovative operations. Due to the support of our community (authors, reviewers, and editorial board members), the journal of M&SOM has continued to improve. Since we launched the general two-round policy in January 2015, we have observed more paper submissions, shorter review cycle time, and fewer review cycles. At the same time, the impact factor, 5-year impact factor, and article influence score of M&SOM have continued to increase. Finally, in July 2016, we received the great news that Financial Times decided to include M&SOM on the FT 50 journal list beginning January 2017. We strive to do innovative research that has impact, not only in terms of opening pathways to other researchers but also in terms of how it affects practice and gets appreciation from the broader research community. Identifying innovative and impactful research ideas can be easier if one has an eye on the dynamics of what is relevant in the business world. In this blogpost, we aim to highlight an opportunity to do innovative and potentially impactful operations management research in a particular research field, sustainability.